There’s nothing advanced about “advanced stats.” More often than not, they merely refer to a team’s share of the shot attempts and scoring chances at 5-on-5. The larger the share, the greater the odds of winning. It’s a simple and logical view of the sport, and Los Angeles and Chicago’s recent championship teams were the poster children for a movement that has taken the league by storm. But there are exceptions to every rule. In 2018-19, the Washington Capitals continue to make their case for pure talent above all else. Despite less than sparkling metrics, the reigning Stanley Cup champions are 17-9-3 and sit atop the Metropolitan Division. According to Natural Stat Trick, they control only 48.1% of shot attempts (22nd) and 48.7% of scoring chances (22nd). It’s difficult for any club to win games under those circumstances, yet head coach Todd Reirden’s troops seem entirely capable of doing so — and doing so repeatedly. Since Washington pulled off this same feat last year with a 49-26-7 record under Barry Trotz, it’s hard to pin this performance on puck luck. It ranked 24th in CF% and 23rd in SCF% in 2017-18. Moreover, the Caps ranked just 16th defensively and 15th on the penalty kill. This season, they rank 19th on defense and 22nd on the PK. So how are they successful without dictating the play? In plain terms, they know how to score. They’re currently averaging 3.62 goals per game, which is the third-highest mark in the league. Alex Ovechkin is obviously the main attraction. The 33-year-old sharp-shooter is aging gracefully by finding gaps in coverage and making teams pay for any slip-ups. He leads the league in goals with 22 and ranks ninth overall in scoring. The whirling dervish who could take on entire squads by himself is long gone, but that’s OK. Washington’s captain has adapted to the times and leveraged his skill set in order to capitalize on as many chances as possible. Like most great finishers, he not only slips into quiet areas but can convert on passes that aren’t necessarily in his wheelhouse. His ability to fire a one-timer in nearly any situation is special. Defending that type of weapon requires a legitimate shutdown specialist, but few coaches have the luxury of sending Drew Doughty over the boards. Beyond OV, the Caps are blessed to ice two great centers in Nicklas Backstrom (34 points in 29 games) and Evgeny Kuznetsov (27 points in 23 games). Both have enjoyed shifts with Ovechkin this year and both have thrived because they’re such gifted playmakers. The fact that both of them have registered nearly one assist per game in 2018-19 is remarkable. With a few key injuries to start the year, this combination has proven a particularly useful asset. Though Backstrom and Kuznetsov are pass-first pivots who sport identical point-per-game averages (1.17), they take different approaches. Backstrom is more methodical, usually opting for smart, low-risk setups that put his teammates in advantageous positions. In spite of his baby face, he’s also a tank in the corners, regularly fending off defenders to maintain control. Meanwhile, Kuznetsov is in perpetual motion. He pairs effortless skating with masterful vision to mystify defenders. They simply don’t expect him to pick his passes, yet he constantly threads the needle. Last season was his coming-out party as a full-fledged superstar. These centers are especially valuable on the power play. Washington ranks seventh in this respect, and that’s largely due to the duo’s blend of composure, touch and creativity. On the back end, John Carlson has quieted any inklings that 2017-18 was the result of contract-season performance. Fresh off signing an eight-year, $64 million extension, the 28-year-old ranks third among NHL defensemen in scoring (30 points) and second in power-play scoring (14 points). His production rate has actually increased this season, which should put any fears of complacency to bed — at least for now. His willingness to shoot and knack for getting the puck past the first wave of defenders is crucial on a team that doesn’t dominate in possession. Since Washington seldom dictates the play, it needs to get the most bang for its buck when it does have control. All four of these staples have performed well this year, yet only Carlson boasts a CF% above 50. That speaks to how deadly and opportunistic these stars are. It doesn’t matter if you control 60% of the game: They only need a mistake or two to pounce on. That style is surely demoralizing to play against too, as you could deliver a textbook outing and still suffer the sting of defeat. And once you lower your guard against Ovechkin and company, the floodgates open. While the Caps’ possession and scoring-chance numbers are ugly, they’ve ranked ninth (52.6) and third (55.9) in GF% over the last two years. Unlike most teams, they truly can outscore their problems. 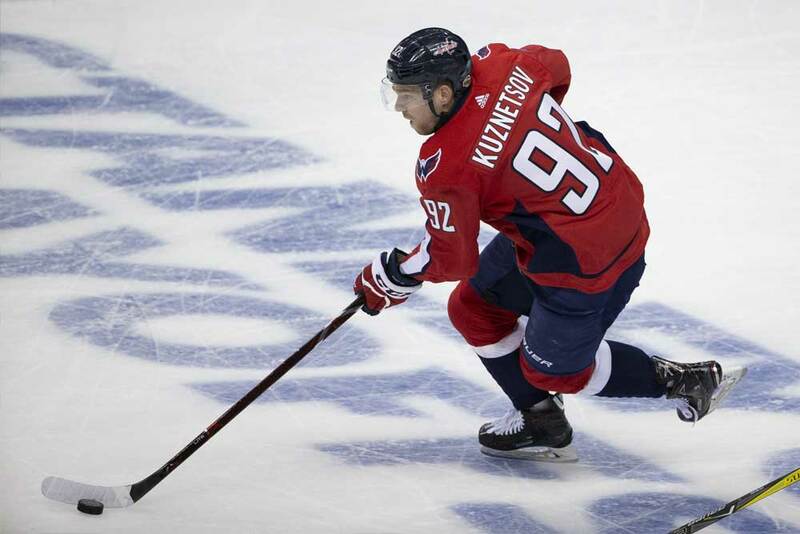 This quick-strike brilliance has allowed Washington to survive dreadful campaigns from Dmitry Orlov (45.3 CF%, 45.5 SCF%, 43.4 GF%), Matt Niskanen (43.6 CF%, 42.6 SCF%, 44.2 GF%), Lars Eller (47.8 CF%, 47.4 SCF%, 40.6 GF%), Chandler Stephenson (45.7 CF%, 45.8 SCF%, 35.7 GF%) and Andre Burakovsky (47.6 CF%, 47.7 SCF%, 40.7 GF%). Without the skill to overcome three-zone deficiencies, these players have come under the microscope for their sloppy puck management, weak coverage and general lethargy. Starting netminder Braden Holtby (2.85 GAA, 91.1 SV%) is enduring his second straight mediocre season between the pipes as well. The defense in front of him is hardly airtight, but he’s not stealing games like he did a couple of years ago either. Goaltending is not bailing this team out in the slightest. Ultimately, this may boil down to a core embracing its identity following years of postseason frustration. It doesn’t govern the play. It counterpunches — and it hits like a ton of bricks. Ovechkin is as lethal as ever, Backstrom is in fine form, Kuznetsov has maintained his star trajectory and Carlson is a massive threat from the blue line. Moreover, Tom Wilson (14 points in 11 games) has settled nicely into his top-six role, TJ Oshie (14 points in 18 games) is a calming presence in the trenches and 22-year-old Jakub Vrana (19 points in 28 games) has done well to provide the complementary scoring Washington was likely hoping to receive from Burakovsky (eight points in 29 games). Granted, the team probably won’t shoot a league-leading 10.7% all year. It converted at a rate of 9.2% last season, so a minor regression is expected. 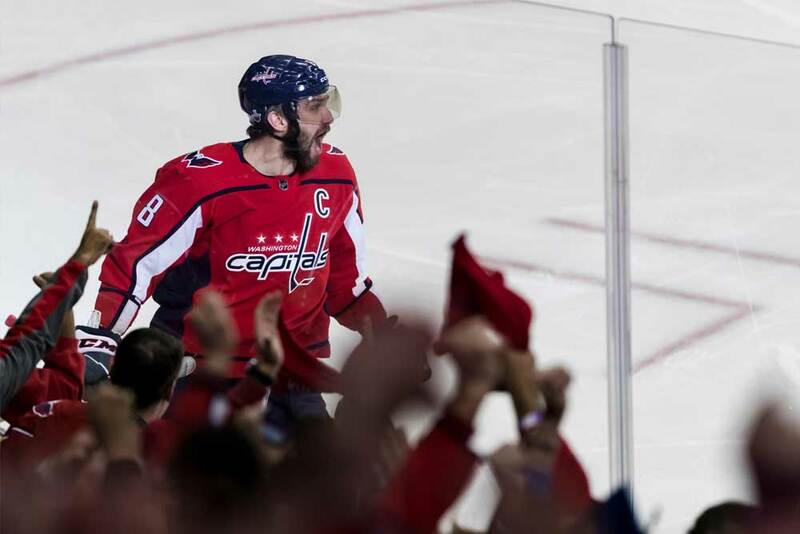 In the meantime, the Caps will ride their potent offense for as long as possible. After all, a win is a win, and they’ve racked up plenty of them.